ich finds toll dass sie nach Spectrum noch ein weiteres mal zusammen arbeiten. Spectrum war schon Top das kann man von diesem ebenfalls sagen!! edit: nach einiger zeit erhoehe ich auf eine verdiente 6* im moment vergleichen die mesiten dies mit " She Wolf" von guetta und Sia, wobei ich sagen muss "Sweet Nothing" ist um welten geiler!!! But I like this now. Even if it does bordering on the loud for the sake of loud approach, the music stays interesting enough to forgive it, Stop giving Florence sweet gherkin everyone though. Strangely for a song involving Calvin Harris, I didn't really like this one that much. Neither the singing or techno music really caught me on this occasion. 2.75*. Growing to like this one. 2.75* -> 3.75*. nettes gespann, die beiden, aber kein überflieger. edit: obwohl die zutaten stimmen, schmeckt mir das von mal zu mal irgendwie weniger... runter auf 3! This really is comparable to recent Guetta/Sia collaborations and I've not yet decided if that's a good or bad thing. 3* for now. Changed my mind, this is seriously good. 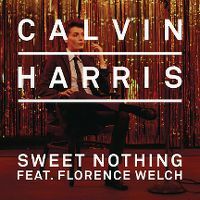 I am so glad we've got another Florence/Calvin collaboration! 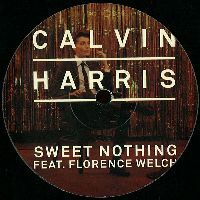 Happy for Calvin that "Sweet Nothing" is doing so well for him but can't really understand why its performing so well. Personally, I feel that his other singles, "Feel So Close" and "We'll Be Coming Back" are much better and would much rather see them peak at #2 or #1 rather than "Sweet Nothing". However, this song might grow on me but at this point in time it doesn't seem likely. I guess it has grown on me after all! But I still don't think its as strong as his previous singles and would much rather see "We'll Be Coming Back" perform stronger. Der Song braucht etwas, bis er ins Ohr geht. Die "Florence"-Sängerin hat eine gewöhnungsbedürftige aber recht interessant-schöne Stimme. Die Stimme wäre echt nicht schlecht, aber dieses Elektronikgesäusel ist doch sehr mager. Edit: die Stimme und die Strophen sind wirklich gut, der verdient eine 4. Unglaublich, seit 16 Wochen dabei, obwohls grad mal die Top-30 Grenze erreichte. Der Beginn geht noch, dann nervts einfach nur mehr. Really generic but Florence saves it from ultimate disaster. EDIT : I've warmed to this now. The best single from an otherwise crap album. Loved this upon first listen but then became tiring towards the end, just way too much saturation on the TV and radio. Peaked at #9 on my personal chart. Came in at #134 on my TOP 200 OF 2012. Shocked and surprised by its debut at #2 considering Florence + the Machine nor Calvin have had big hits prior to this in Australia! The really good backing music eventually made me like this. The best thing that both acts on this have ever done. Super Track der Club wie auch alltagstauglich ist! I just could not warm to his collaborations with Florence. I think I personally don't like her vocals with Harris' production. This is still a fine job though.